This wine region has been flying under the radar for some time, but Roussillon is gaining serious traction with sommeliers and wine enthusiasts across the globe. 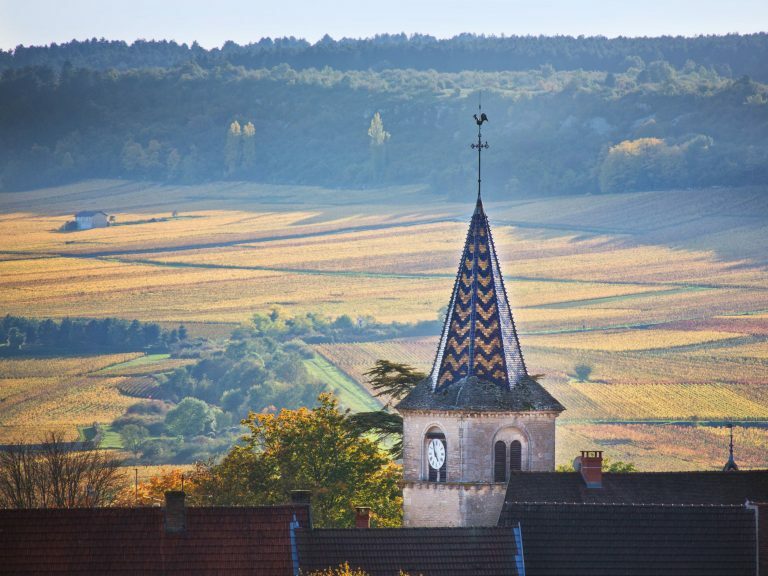 Its distinctive collection of micro-terroirs, exceptional fruit from old vines, and long-established viticultural know-how are just some of the factors that make this southern French region so compelling. 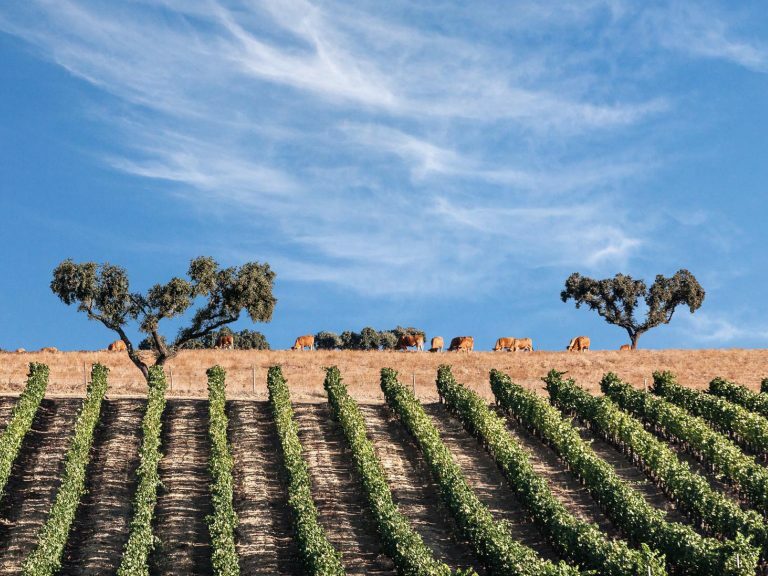 Pioneering winemakers—many of whom are focused on creating organic and biodynamic wines—are also bringing new energy to the region. 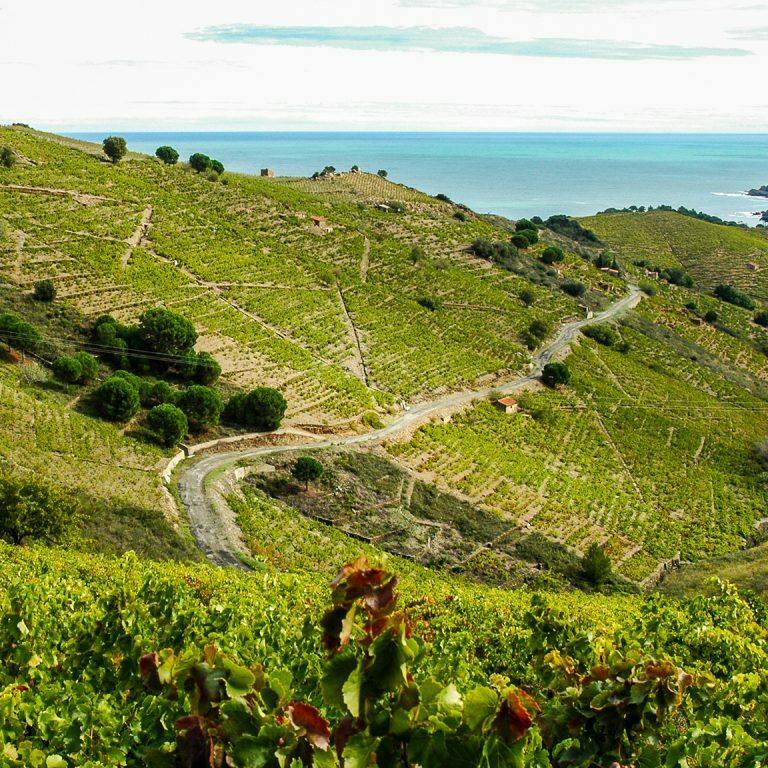 Roussillon offers a tantalizing selection of expressive dry white, rosé, and red wines at great value—and is particularly renowned for its world-class vins doux naturels, or fortified sweet wines. Photo courtesy of Vins du Roussillon. One of the Old World’s most underrated wine regions, Roussillon is lately making a name for itself as a first-rate producer of diverse dry and sweet wines made from a number of grape varieties. Since the middle of the 20th century, the winemaking community in Roussillon has been committed to producing low yields of high-quality grapes. 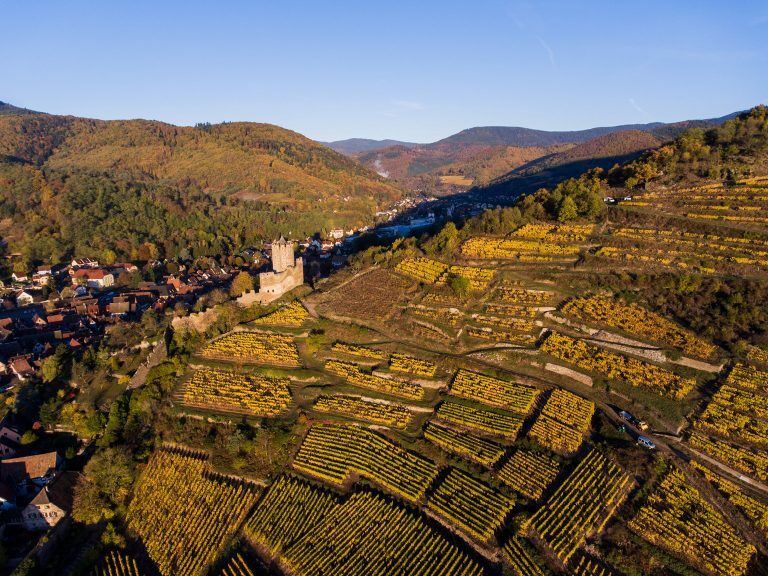 The region currently boasts the lowest yields in France, averaging less than half the yield of any other appellation d’origine protégée (AOP) in the country. Its wines are now receiving international acclaim. Roussillon, whose capital city is Perpignan, is often associated with the greater Languedoc-Roussillon region, but it stands out in many ways and has its own specific identity. The region represents 2 percent of France’s wine production by volume; however, it produces at least 80 percent of the country’s AOP-certified vins doux naturels. The production of these traditional fortified sweet wines is something that sets Roussillon apart from France’s other wine regions, as Roussillon remains the leading producer of the style in France—and even one of the leaders in the world. Roussillon also leads in its commitment to organic and biodynamic viticulture, possessing the highest percentage of organic and biodynamic vineyards in the country. 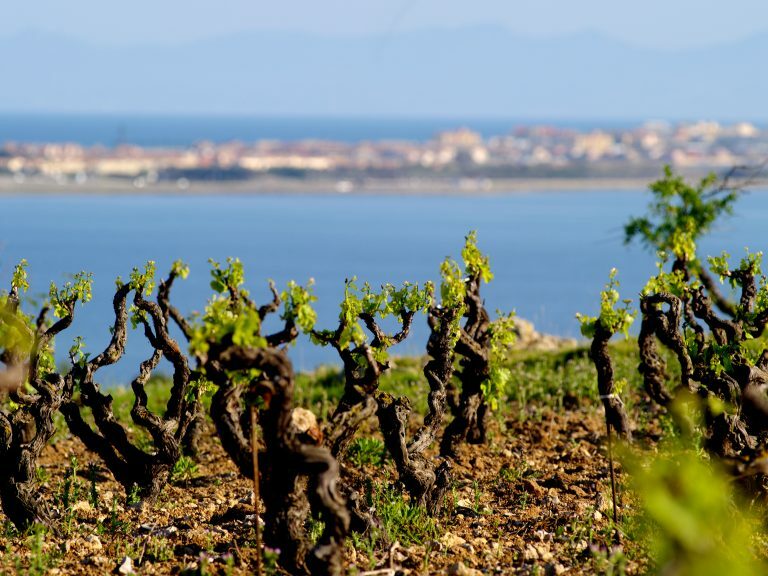 There are 21,400 hectares under vine in Roussillon, according to 2016 figures. The vineyard area in its totality is planted on slopes with elevations rising to 650 meters. Approximately 70 percent of these vineyards are devoted to AOP wines. The average yield in 2016 was approximately 28 hectoliters per hectare. There are 2,200 winegrower families in Roussillon working in 350 private cellars and 25 cooperatives. The latter drive 75 percent of the region’s wine production. The majority of wineries are small and family-owned, possessing an average vineyard size of 10 hectares. This small wine region is located in the south of France near Spain’s Catalonia region. 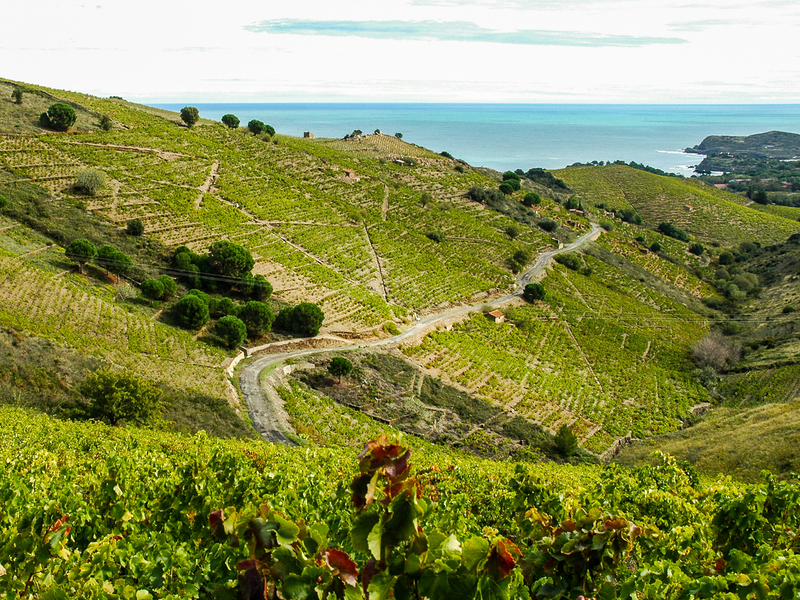 Topographically and geologically, it’s notably different from the rest of the Languedoc. With an average of 325 days of sunshine a year, it’s France’s driest and hottest region. In Roussillon, the summers are hot; autumns and winters tend to be mild. Rainfall accumulates primarily in the autumn and early spring. The mountain ranges that surround Roussillon on three sides—the Corbières to the north, the eastern part of the Pyrénées-Orientales and Mont Canigou to the west, and the Albères to the south—form the shape of an amphitheater. In the east, Roussillon opens to the Mediterranean Sea. In addition, three rivers—the Agly, the Têt, and the Tech—help define the topography of the region and moderate its Mediterranean climate. Because of the high degree of variation in its geology, Roussillon boasts an impressively diverse range of soils and subsoils—from the limestone-rich red soils around the Corbières to the stony, sandy, clay, and silt soils near the coast. Most of the terrain consists of clay, calcareous limestone, schists, granite, and gravel. Another climate-moderating influence in the region is its numerous frequent winds—the most significant being the tramontane. These winds provide natural protection for the vineyards by warding off pests and diseases—and they’re one of the reasons Roussillon is home to so many organic and biodynamic vineyards, and agriculture in general. 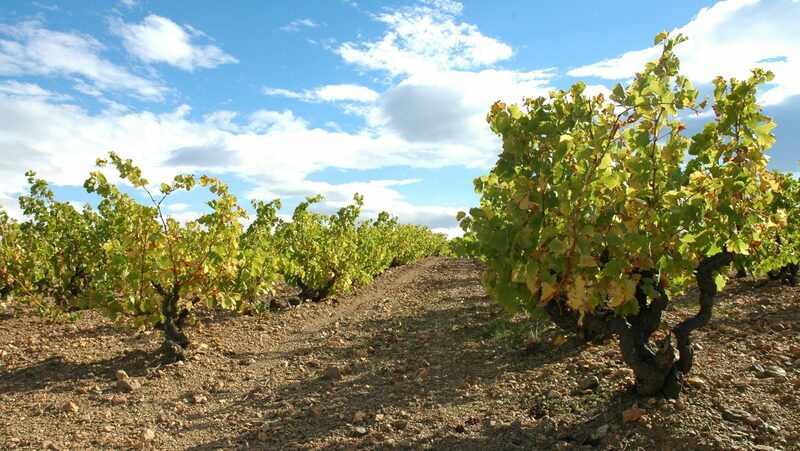 The viticulture of Roussillon was established by the Greeks in the 7th century BC. At that time, Greek seafarers from Corinth were involved in the profitable iron trade, and when they settled in the inlets of the Côte Vermeille, they brought vines from Greece. Roussillon’s viticulture was further developed by the Romans, who expanded into the Narbonnaise, one of the four provinces of Roman Gaul, which became the main trading hub for wine and remained so for many years. 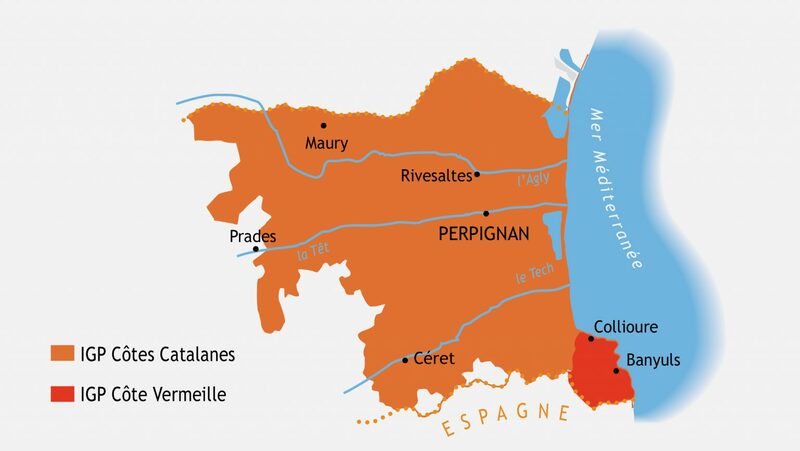 One of the most significant events in Roussillon winemaking history was the invention of mutage in 1285, reportedly by Arnau de Vilanova, the rector of the University of Montpellier and a doctor at the court of the King of Majorca, which was located in Perpignan. Mutage is the process used to make vins doux naturels. During alcoholic fermentation, the winemaker adds pure neutral alcohol of wine origin (96% ABV) to the fermenting must at a proportion of 5 to 10 percent of the must’s volume. This stops the action of the yeasts before they have converted all the sugar into alcohol and thus preserves part of the sugar from the fruit. From the 13th century forward, trade in Roussillon wines turned toward Catalonia in the south, but also toward Italy in the east, and France and Flanders to the north. The area was ruled by Spain—the kingdoms of Majorca and Aragón—from the 13th through the 17th centuries. It was not a period that favored winemaking in Roussillon. Nevertheless, the reputation of the wines grew. The vast majority of wines exported to the capital were the sweet wines—they traveled better, their taste was unique, and their high price made up for transport costs. Roussillon did not become part of France until 1659. Even today, many people in the area identify themselves as Catalan. 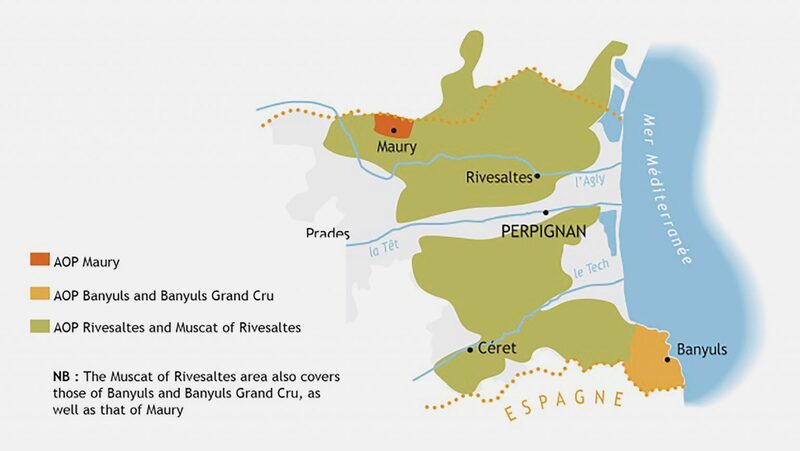 In the 17th century the construction of the Canal du Midi, which linked the Mediterranean to the Atlantic, enabled Roussillon wines to move into new markets, where they entered into competition with Bordeaux wines. In 1790, Roussillon was designated as the department of the Pyrénées-Orientales. Between 1820, when the land registry was created, and 1880, the region’s vineyard area grew from 38,000 hectares to nearly 80,000. In 1882, though, many of Roussillon’s vineyards were destroyed by the phylloxera blight. When it became possible to graft new vines onto phylloxera-resistant American rootstock, the vineyards were gradually able to recover. By 1906, the surface area was covered with 65,000 hectares of vines; however, the quality of the wines being produced at that time was not very high. The modern effort to classify the red, white, and rosé wines of Roussillon was inaugurated in 1930 with the creation of the professional association of winegrowers of Haut-Roussillon. Vins doux naturels were the first to benefit from the appellation d’origine contrôlée (AOC, now known as AOP) system, starting with the Banyuls and Maury AOCs and then the Rivesaltes. In the 1950s, in an effort to foster quality and reunification, the Côtes du Roussillon appellation was created. In 1977, Côtes du Roussillon and Côtes du Roussillon Villages were awarded AOC status. Since then the wines have continued to improve, reflecting the region’s commitment to quality standards. The Roussillon region produces dry, still wines and vins doux naturels. With 15 AOPs authorized to use 17 different grape varieties—and three IGPs, there’s a wealth of wines coming out of Roussillon, each of which has its own character. Of the 24 white, gray, and black grape varieties commonly used in Roussillon, 17 are authorized for AOP wines. Grenache Noir is the most widely planted grape, followed by Syrah and then Carignan. These grapes play an important role in the region’s dry red AOP and IGP wines. Grenache Noir is also a key variety in France’s finest vins doux naturels, Banyuls, Maury, and Rivesaltes. A large number of Muscat à Petits Grains and Muscat d’Alexandrie vines are also planted throughout the region, mainly to provide fruit for the Muscat de Rivesaltes Vins Doux Naturels, but these days they’re often used as well for dry IGP wines. In 2016, Roussillon produced a total of 604,457 hectoliters of wine, including 129,218 hectoliters of AOP vins doux naturels, which accounted for 21 percent of overall production; 248,696 hectoliters of AOP dry wine, which represented 41 percent; and 202,044 hectoliters of IGP wine, making up 33 percent. The remaining 24,499 hectoliters were accounted for by wines without any geographical indication, as well as other products. AOP dry wines are blends made with a minimum of two or three of the following grapes: Grenache Noir, Grenache Gris, Carignan Noir, Carignan Blanc, Cinsault, Lladoner Pelut, Mourvèdre, Syrah, Grenache Blanc, Macabeu, Malvoisie du Roussillon, Marsanne, Roussanne, Vermentino, and Viognier. AOP fortified sweet wines can be blends or single-varietal wines made from Grenache Noir, Carignan Noir, Grenache Blanc, Grenache Gris, Macabeu, Malvoisie du Roussillon, Muscat à Petits Grains, and Muscat d’Alexandrie. IGP wines can be blends or single-varietal wines. Widely planted in both Spain—where it’s known as Garnacha—and southern France, Grenache Noir is a rich grape that yields wine with smooth and delicate notes of cherry and plum. It’s a key variety in the region’s dry blends; it’s also the red variety most suited for the production of vins doux naturels. A common blending partner for Grenache and Carignan, Syrah provides structure to Roussillon’s dry reds, rosés, and some vins doux naturels. In addition to creating aromatic dry rosé wines, Syrah is known for producing supple, savory, age-worthy red blends, which develop in flavor from red fruit and violet notes to licorice, truffle, and leather. Roussillon has many old, well-established Carignan vines that thrive in the region’s soils. A key component of many of Roussillon’s dry red wines, Carignan is often blended with Grenache Noir, Cinsault, Syrah, and Mourvèdre. It’s a late-ripening grape that flourishes in hot climates and is mainly used in Roussillon to make bold, dry red blends that are strong and structured with red fruit, spice, and garrigue notes. Typically cultivated along the Mediterranean, this variety yields dry wines with intense color and firm structure. It offers strong tannins and complex notes of black fruit, spice, and garrigue and is often used in Roussillon’s more age-worthy wines. Also known as “small-grape Muscat,” this variety has been grown in Roussillon since antiquity. It is a highly aromatic grape with distinctive floral notes that also offers notes of citrus, exotic fruit, and delicately musky spices to create vivacious, rich, and smooth wines. It’s used in both the region’s dry white and fortified sweet wines. Muscat d’Alexandrie vines produce large, firm-skinned, fragrant berries that are an ideal complement to Muscat à Petits Grains, and like wines made from small-grape Muscat, dry wines and vins doux naturels made with Muscat d’Alexandrie tend to be characterized by minty, floral notes as well as notes of white- and yellow-fleshed fruit. Also known as Macabeo, this variety produces light, round, delicate wines with flavors of white and yellow fruit and white flowers when harvested at peak ripeness. Macabeu is used for both dry wines and vins doux naturels. Another grape used for both the region’s dry and fortified sweet wines, Grenache Blanc produces rich, smooth, full-bodied wines with floral and aniseed notes and a long finish. Also known as “gray” Grenache, this variety may be found in Roussillon’s dry whites, rosés, and vins doux naturels. It yields powerful wines with notes of citrus zest and aniseed. Wines made from Grenache Gris are characteristically voluptuous, round, and elegant with vibrant minerality. Others: Cabernet Franc, Cabernet Sauvignon, Carignan Blanc, Carignan Gris, Chardonnay, Chenanson, Cinsault, Lladoner Pelut, Malvoisie du Roussillon, Marsanne, Marselan, Merlot, Roussanne, Sauvignon Blanc, Vermentino, and Viognier. What’s Happening in Roussillon Today? Because Roussillon is receiving increased recognition as a producer of a diverse range of delicious, fine dry and sweet wines, the region is expanding into foreign markets. Overall, Roussillon exports 22 percent of its total AOP dry wines and 2 percent of its vins doux naturels to the rest of the world, and the region is seeing especially strong growth in exports to the U.S.
From 2010 to 2016, Roussillon’s AOP wine exports to the U.S. increased by a whopping 165 percent, with just over a million bottles exported in 2016. The U.S. is now the third largest export market in volume for Roussillon AOP dry wines, after China and Belgium; it’s the number one market in terms of value. It’s also the number seven export market in volume for the region’s vins doux naturels, and number one in value. Fortified sweet wines—primarily Banyuls and Rivesaltes Ambrés—represent 3 percent of exports to the U.S. The dry AOP red, rosé, and white wines, as well as the region’s vins doux naturels, are being crafted with passion and precision, and they’re getting better with each vintage. Many winemakers who favor natural practices are helping build the region’s reputation as France’s number one producer of organic and biodynamic wines. 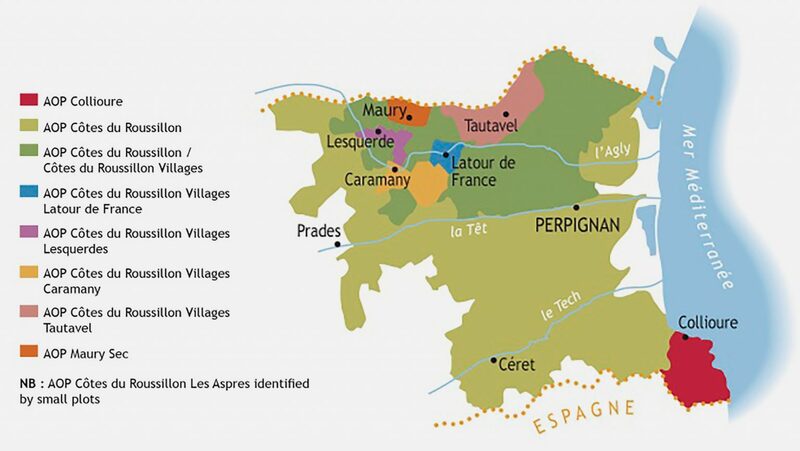 As a sign of the region’s evolution in quality, the Côtes du Roussillon les Aspres appellation is transitioning into the higher-ranked Côtes du Roussillon Villages les Aspres as of the 2017 vintage, to highlight the excellence of the terroir where these wines are produced. Investments made by foreigners are also helping support quality production and distribution throughout the world of Roussillon wines. As a result of the region’s successes, there is a new international demand for its wines, which pair well with many of the world’s most popular cuisines, including French, Italian, modern American, and Asian (including Chinese, Japanese, and Indian). Besides providing an excellent alternative to spirits, the vins doux naturels pair wonderfully with a meal of game meat, as well as sweet and sour cuisines. They are also perfect at the end of a meal to accompany cheeses, fresh fruit, and desserts.